From April of 1862 until September of 1865, over 10,000 Confederates passed through Johnson’s Island Civil War Military Prison leaving behind an extensive historical and archaeological record. One of the unique aspects of the prison is it only held officers. The 16.5 acre Johnson’s Island Prison Compound contained 13 Blocks (12 prisoner housing units and one as a hospital), latrines, Sutler’s Stand, 3 wells, pest house, 2 large mess halls and more. There were more than 40 buildings outside the stockade (barns, stables, a lime kiln, forts, barracks for officers, a powder magazine, etc.) used by the 128th Ohio Volunteer Infantry to guard the prison. Two major fortifications (Forts Johnson and Hill) were constructed over the 1864/65 winter, and were operational by March of 1865. The prisoners on Johnson’s Island endured harsh winters, food and fuel shortages, disease, along with the mental anguish of uncertainty about their families and their own futures. Current research suggests that close to 250 prisoners died on Johnson’s Island during the war. Heidelberg University is offering a five week field school for undergraduate college students, graduate students, graduating high school seniors (2016 grads), incoming first year college students, non-traditional adult students, and for degree holding students who wish to gain extensive field experience or expand their knowledge. This is an excellent opportunity to gain archaeological experience as well as learn about the U.S. Civil War and the prison system. In addition to the field experience there will be laboratory sessions in the archaeological laboratory on the Heidelberg University campus. Participants in the field school will gain experience in basic excavation techniques, on-site photography, the recording of archaeological data, and the identification and conservation of historic cultural materials. 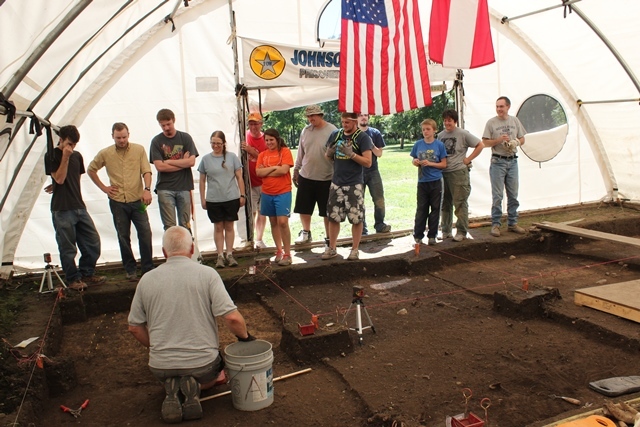 Students will work at the site Monday through Friday (8:30 a.m.-3:30 p.m.) for five weeks. . Johnson’s Island is connected to the mainland through a causeway built from Marblehead to the island in 1972. Housing is available through Heidelberg University in Tiffin, Ohio with transportation provided to the site. No previous experience is required. All enrollments must be for the full 6 hours and for the full five weeks. Enrollment in the program is limited to 12 and admission to the course is based on the order in which applications are received. Two texts are required for the course. Application Deadline is May 27, 2016. Since the spring of 1989, Dr. Bush has been investigating the Johnson's Island Civil War Prison. This site, located on a small island in Sandusky Bay, Lake Erie (just north of Cedar Point) held over 10,000 Confederate officers captured at hundreds of battles during the Civil War. One of the unique aspects of this site is it only held officers. Past research has allowed us to specifically locate many of the special use areas of the prison. We have conducted investigations at Block2, 4, and 8-general housing blocks and Block 6, the prison hospital. In the mid-1990s, preliminary investigations were conducted at Block 8. In 2010 we again explored both a latrine and the building location of Block 8. In the past few years, we have excavated half of the location of Block 8 as well as completing the excavation of Feature 124, the later 1862 latrine. In 1994 we opened up Feature 14, an 1863 latrine from Block 8. We spent several years at Blocks 4 and 6, developing a very comprehensive collection of cultural materials from these blocks. This year we are hoping to complete the entire Block 6, hospital, excavation. In 2015 we excavated the northwest extension of Block 6, which we believe was the prison hospital’s mess area. The area produced many items related to food preparation as well as medical containers. The excavations this year should give us a look at the northern end of the building and complete our work at the hospital. We will also be excavating one of the latrines from Block 8 this coming summer. The latrine was originally opened up in 1994 where only a small portion of the northern half was excavated. Our intent is to expose the remainder of Feature 14 (the latrine) and continue its excavation. This latrine was used in the latter part of 1863 by the occupants of Block 8. Tuition for 6 hours of undergraduate academic credit is $2970.00, plus $170.00 in lab fees. Students will be enrolled in ANT 250 & ANT 251 concurrently. The field school courses can also be taken on a non-credit basis (Audit) at reduced cost. Tuition for students who desire the field experience but do not require academic credit hours is $1485.00 with lab fees of $170.00. Housing cost is $450.00 for the 5 week stay. Students live in campus houses or apartments and provide their own food service. Travel costs: Transportation is provided daily M-F to the archaeological site. Students provide their own transportation to Heidelberg University, Tiffin, Ohio. Next topic: "NMU 2016 Summer Archaeology Field-School on Beaver Island, Michigan "
Previous topic: "Field School Excavating a Historic Rice Plantation in North Carolina"